Wow, I wasn't aware that Vibroplex was making those chromed beauties these days. From the wording on their site, it appears that the Katsumi has suffered a death in the family and that the paddles are no longer available. Now that's a pity. One of the reasons I am able to achieve letter-perfect sending at 61 wpm is because both paddles shown above have "squeeze" keying capability built in. In other words, if the paddles are hooked up to a truly automatic keyer (either external or in your radio), you can hit one side of the paddle first, hold it there, and then hold the other side. That will give you a continuous -dih-dar-di-dar-di dar for hours on end. So what? Well that ability is one way -- perhaps the best way, dunno -- to send perfect code. The letter "C" for example can be 'created' by doing the double-sided-hold-down described above, twice. Or a period, three times with the procedure. Here comes the opinion part. Be careful -- very careful -- to understand before you buy, that a semi-automatic key (sometimes referred to as a 'bug') is EXTREMELY hard to send correct Morse with. There's a mathematical reason for that if anybody wants to know. Look for a key that has paddles that 'squeeze' and be sure your keying electronics does dots and dashes that fully complete themselves, else you'll seriously irritate the guys trying to copy your "fist". WA4STO, what's your take on magnetic return paddles. I've been wanting to buy the VibroCube "standard upgraded" model, but the $220 price tag has kept me away. That's why I'm looking at the magnetic "Code Warrior Jr" for $110. I don't like the transparent finger pieces, but those can be replaced..
Gil -- I have zero experience with them. In fact, I never heard of the term "magnetic return paddles" before. My all-time favorite paddles were the Benchers. Had a set of them in the early 80s right up until about 2008. By then, I had been bouncing around in a Jeep CJ7 with a Ten-Tec Omni-A on the back roads of West Virginia during county hunting contests. Those Vibroplex paddles are just gorgeous. Honestly, I would be that guy that buys one just to look at it on my mantel or something. I'd be afraid to use and possibly tarnish it, haha. Correctly adjusted, almost any keyer will allow you to send good CW according to your ability. Consistency is probably the thing that those 'magnetic' keys are good for. No spring adjustments to loosen up, etc. Becoming acquainted with a particular key is the hard part and it just takes time. I've done the straight key, 'bug', and keyer thingys. Being lazy, I've pretty well stayed with the keyers. 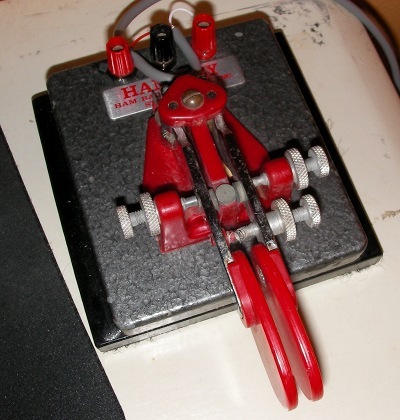 I've used an old Vibroplex keyer, Benchers, and now that 'Cube'. I have had more experience with the Benchers than any, but am learning that 'Cube' now. Any two keys will be different in some way, even two of the exact same make/model. Getting it 'set' for you, how you like the thing set, is the biggy. It changes over time so knowing how to set up a key is very nice to know. Everyone is different and everyone doesn't use the same contact spacing or tension. There is no -one- way of adjusting a key, there's only the best way for you AT any particular time. When you do become familiar with the key AND listening to CW you will find your self making some adjustments (fine ones hopefully). If you are constantly making some adjustment it's probably time to take a very close look at the key, and/or your operating style. One of the two is changing for some reason. Lot's of tricks to it, you have to figure out which (if any) work for you. It's not great but it works. I got it off Ebay. It's a "Ham Key" made in St. Louis. I know nothing about it. FTR, I use a WW-II vintage J-37 for a straight key (and have a couple spares) because I like the leaf-spring vs. the J-38's coil version. For the paddle I'm using a '61 Vibroplex Vibrokeyer. I would like a bank made up as one of those, or even a Salt and Pepper shaker set. Very pretty.